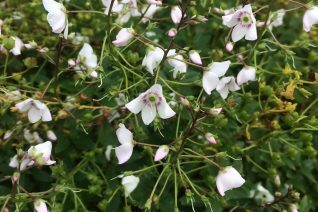 Long, long, blooming elegant little evergreen perennial that supplies clouds of white flowers with a prominent plum colored eye. 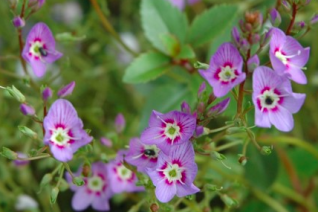 This low growing plant to 10″ tall can spread to 2′ wide in time. Blooms appear from spring to mid summer. The evergreen foliage is handsome for the rest of the year. Full sun and rich, well drained soil with light but consistent summer water. If it gets a bit straggly with time simply cut back 3/4 of the plant in early spring and make sure to water and add a handful of all purpose organic foliage. 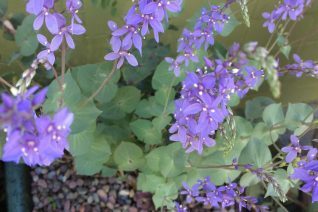 Very easy to grow in rock garden conditions or the front of a border.